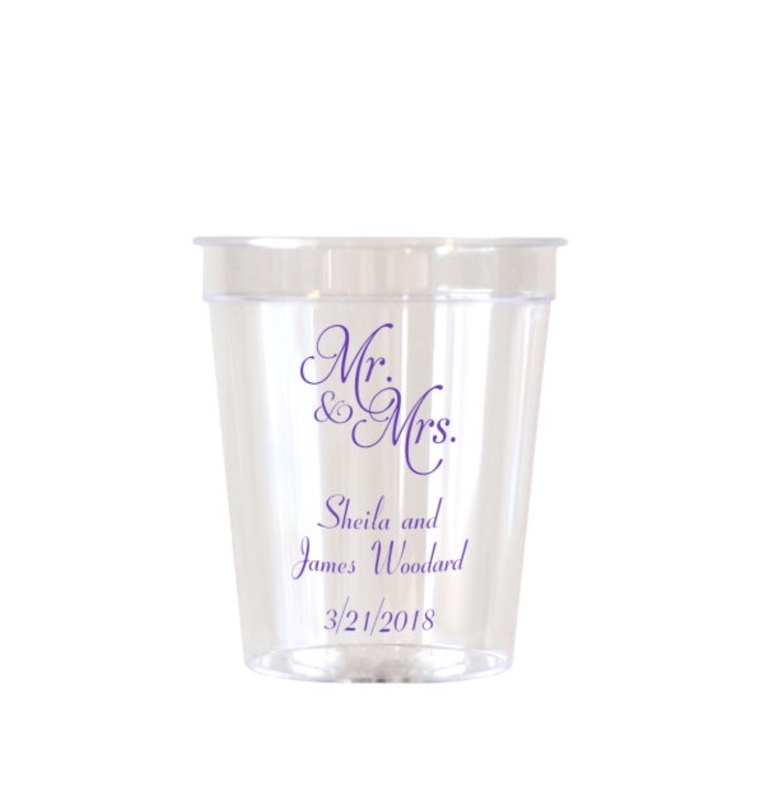 2 Ounce clear plastic whiskey and jello shot cups personalized with choice of design and up to 3 lines of custom print make the perfect favors for toasting the bride and groom throughout the wedding reception. 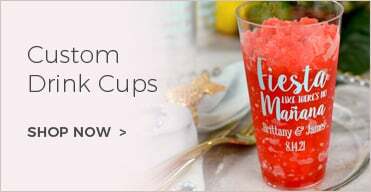 Made of clear, hard plastic, each cup measures 2 1/4 inches high by 2 inches in diameter at the widest point to hold 2 fluid ounces when filled to the brim. Choose from assorted design options, monogram formats, and lettering styles to print up to three lines of custom text. Second sided cup printing is also available at no extra charge. You can also use these plastic shot glasses to hold candy favors or mini desserts for your tasting trays. 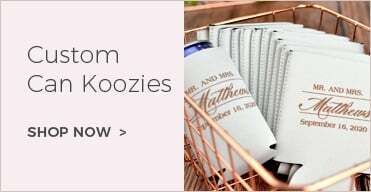 Perfect souvenir gifts for your guests at a wedding reception!!! Very reasonable priced. The only issue is the print is a little hard to see. We ordered the purple print, but other than that. We are pleased with the product! I loved that I got a call form Molly to let me know changes that could be made to make my order better. I had ordered these before & loved them but on this order, on the side with date, & name was really hard to read. Although this could have been the way I ordered them. I just wished that side was easier to read. I will order again. The customized shot glasses were perfect for our toasts at our wedding. We opted out of a champagne toast and did a shot toast instead. Great quality and quick turn around. The added personalization is so tiny, it is not readable without a magnigying glasd. Received shot glasses. Exactly what we wanted. Fast delivery. Love the shot glasses. The writing on them is the perfect size and we cannot wait to use them. Cups look great and we're delivered quickly. Very responsive in showing what the shot glasses would look like. Our reception is in February; however the quality of theses shot glasses did not disappoint me or my fiancé. We are very happy!!!!!! Item was as I expected, based on other reviews. I reccommend choosing a large font. The thin lines of the font I chose dont stand out well. I ordered these amazing little shot glasses for a boat party. They were a big hit. I ordered them extremely late, so I had to do rush printing and rush shipping. Totally worth the price. You guys saved me. Can't say thank you enough!! I love my shot glasses. The wording is a little small, but it's still readable. The colors are perfect! Shot glasses were the perfect size the perfect favor and even with some scratches on some of the order the representatives made sure to accommodate me!!!!!! I was disappointed how small the font was. Customer service was exceptional and the end product is Awesome Amazing...I can see myself using them again for something else. Happy customer all the way around. I was very pleased with these. 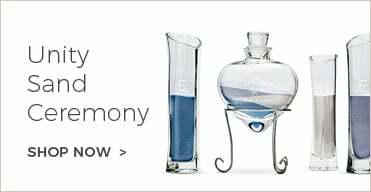 They make a really nice keepsake for any event for shots or for catering. I had placed 1 order then I realized I had order something else so i placed 2. Fortunately the representative emailed me and said she would combine both so that I wouldn't get charged twice for shipping. I received my shipment in great condition. Would recommend. Product was easy to design, I was able to proof it before it was ordered. Fast shipping and really good quality! Great product! 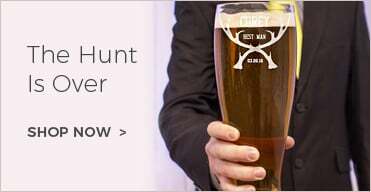 The size is perfect and the plastic is sturdy and of good quality. The custom wording was a nice special touch and customer service was great. Will order again for the next party!